10/25/07 - It has been announced in London that George DeCamp has been named a Highly Commended Winner in the Animal Behaviour: Birds category in the 2007 Wildlife Photographer of the Year Competition. It took a panel of judges 3 months to go over the 32,318 images entered into the contest from 78 countries. The contest awards ceremony was held in the Natural History Museum in London in late October 2007 and was attended by George & his wife Louise. A spectacular evening and a fantastic few days of meetings and fun. The Wildlife Photographer of the Year exhibition displays all 92 winning images in the Natural History Museum in London until April 29 2008 after which it will tour across museums in Britain, the United States, the Netherlands, Spain, France, Italy, Germany, Greece, Poland, Australia, South Africa, Brazil, Hong Kong and the United Arab Emirates. All the images are also published in a commemorative hardback book, Wildlife Photographer of the Year: Portfolio 17 avaliable at Amazon.com. 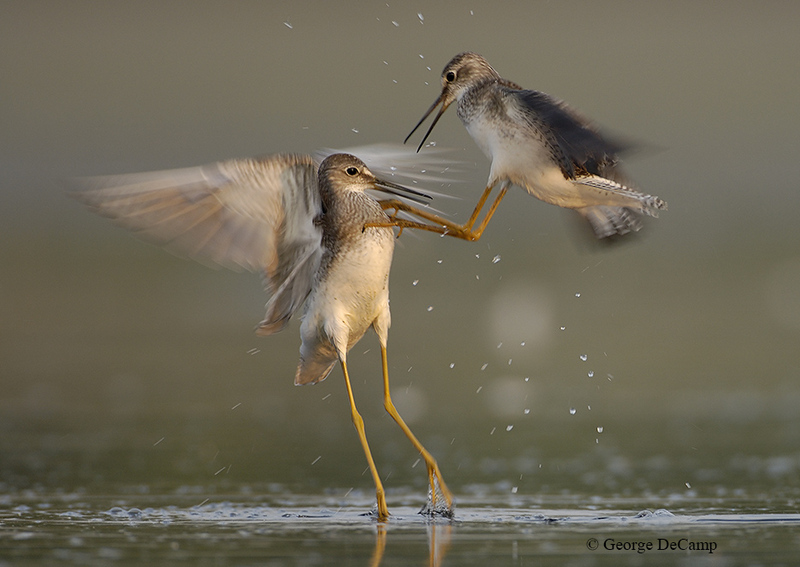 The image was created in Jamaica Bay National Wildlife Reserve on Long Island NY and is 2 Lesser Yellowlegs in combat. Taken with a Nikon D2x and a Nikon 500mm AF-S II lens attached to a Skimmer Ground Pod. The BBC Wildlife Photographer of the Year is the oldest, most prestigious and the largest contest of it's type in the world. Winners in 2007 included photographers from the BBC series Planet Earth, BBC Series The Blue Planet as well as top photographers from magazines such as National Geographic, Condi Nast, etc, and many independent professional Wildlife Photographers from around the world. The competition is owned by Britain's Natural History Museum and BBC Wildlife Magazine and in 2007 sponsored by Shell.